Driverless cars are the future – just around the corner. That is what the tech giants, the auto industry and even the government want us to think. But closer inspection reveals that we are much further from that driverless utopia than we are led to believe by newspaper headlines and by press releases from firms with vested interests. Christian Wolmar argues that autonomous cars are the wrong solution to the wrong problem. Even if the many technical difficulties that stand in the way of achieving a driverless future can be surmounted, autonomous cars are not the best way to address the problems of congestion and pollution caused by our long obsession with the private car. 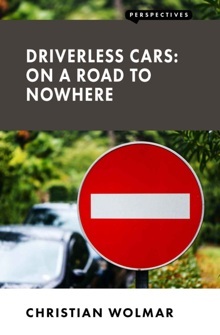 This entertaining polemic sets out the many technical, legal and moral problems that obstruct the path to a driverless future, and debunks many of the myths around that future’s purported benefits.